Prime Minister Matteo Renzi lost his bet on the 4th December referendum. Italians overwhelmingly rejected the proposals for constitutional reform that he and the Minister for Constitutional Reforms, Ms. Maria Elena Boschi, proposed. The final outcome shows 41% in favour and 59% against; the turnout of 65.5% was higher than the previous European Elections (57.22%) and the last abrogative referendum on oil drilling (31.2%). A partial recentralization of powers by intervening on the fifth title (Titolo V) of the Constitution to limit its devolutionary character and completely reshape the role and the composition of the senate. Most importantly, the latter proposal involved a reduction in members of Senate from 315 to 100. The new Senate would have been composed of 74 senators, who would be indirectly elected by regional assemblies in accordance with the population of each region (from 14 senators for Lombardy, the most populated, to 2 senators for the smallest ones). Additionally, each region would have to appoint a mayor as an additional senator. The President of the Republic could also appoint 5 long-term senators. Former Presidents of the Republic would still be lifelong senators by default. A drastic change of the bicameral form of the Italian Republic (sometimes called perfect bicameralism, bicameralismo perfetto, or balanced bicameralism bicameralismo paritario). In this framework, Italy would have left the current system for a new one, based on the prevalence of the Chamber of deputies (camera), and the establishment of some new law-making procedures. The role of the Senate would have been limited to a representation of regions, with an effective law-making power only on local issues and European Union policies. Italy would thus have had an upper chamber elected by the regions to deal with regional issues, not two similar branches with the same duties. Mr. Renzi made a few mistakes during the campaign. First of all, the Prime Minister jeopardized his alliance with Mr. Berlusconi (the so-called Pact of the Nazareno, named after the address of the headquarter of the Democratic Party, currently in Via del Nazareno in Rome). Thus, the latter still able to play some political influence in the parliament and among centre-right voters. Secondly, after the disengagement with Berlusconi, Renzi failed to engage with the left wing of the Democratic Party and his most fervent internal competitors. Thirdly, the constitutional reform was simultaneously linked to the new, runoff based, electoral law: the Italicum. The system is considered by most of its critics as dangerous, since it is a proportional voting system law with strong majoritarian elements. The latter concedes a consistent majority of 55% of seats in the Chamber of Deputies to the party which achieves at least 40% in the first round, and a majority of 53% to the winner of the runoff, independently from the result. Therefore, the Chamber and the Senate have now two different electoral systems. As the Senate was due to play a secondary role and be elected through indirect elections, Renzi intentionally did not foresee a coherent electoral system for the Senate in case of rejection of the constitutional reform. Renzi’s fatal error, however, was to link the outcome of the constitutional reform to his political career. This move backlashed and actually turned the referendum from being a vote on the constitutional reform to a vote on his government’s performance. 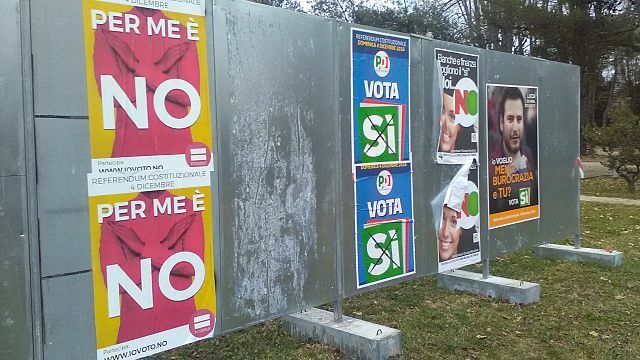 Thus, most of supporters of “No”-campaign took this referendum as an opportunity to dismiss Mr. Renzi. These elements made the referendum more similar to a by-election, and in a lesser sense, a to rejection of the new electoral system. This system is still very likely to be changed by the Parliament regardless, because the Italicum system was planned for only one of the two chambers. Otherwise, will be amended by the Constitutional Court, which is due to rule on it in the next few months. Despite his original intention to leave his post in a [David] Cameron-esque style, Italian constitutional procedures are significantly different from British ones. President Mattarella insisted Renzi resign only after the approval of the Budget law (which needs to be approved by both branches of parliament according to Constitutional Article 81). In any case, Renzi is not going to leave the political arena. Indeed, Renzi is now pushing for a snap general election. If President Mattarella refuses to immediately dissolve the parliament, Renzi would probably support a short-term, transitional government, which would most likely be led by his Minister for Economy and Finance, Mr. Pier Carlo Padoan, or Minister for Cultural Heritage, Mr. Dario Franceschini. In that case, Renzi would probably use that time to take a drastic action against the internal opposition in his party and trigger a snap congress and snap party primaries. The new constitutional proposal received 13,432,208 ballots “Yes” votes, thus boosting the belief that Renzi could work on these numbers to win the next elections. He could also try to attract voters who did not support his proposal, which would then deny the 5 Star Movement a victory in the next election. This route is not automatic, but it is undeniable that Mr. Renzi still has a meaningful support among the public – his current approval rating are considerably higher than any of his political competitors. Nonetheless, the 5 Star Movement is showing a good performance in opinion polls and has very high chances to win the election in case the Italicum runoff system is not abolished. Otherwise, new proposals for constitutional change are not likely to be discussed for the next few years. Rather, it is very likely that after this rejection no new proposal for changing the balanced bicameral architecture will be advanced. The balanced bicameral system will for the time being remain a national, constitutional specificity, just like the UK House of Lords. A vote on EU membership? Many journalist and political representatives interpreted this referendum as a vote against the EU or Euro membership. Yet despite most of Italians having a very poor opinion of EU institutions’ performance during these years, this vote was not about the EU. During the referendum campaign, the EU always remained a very marginal topic. Although Renzi received some formal and lukewarm endorsements from other European and EU leaders and senior representatives, the EU institutions never stepped into the debate. While many Italians consider the Euro as one of the causes of the bad economic performance in the last decade, the ongoing banking crisis in Italy makes calls for leaving the single currency even less desirable. Populist leaders such as Mr. Matteo Salvini (leader of the right-wing and europhobic Northern League) and Mr. Beppe Grillo (political leader of the 5 Star Movement) will try to use the outcome of this referendum to increase their electoral fortunes. Nevertheless, the Italian Constitution remains one of the most supportive in terms of further European integration (Article 11). Furthermore, it does not currently allow for referenda on international treaties and monetary issues. Additionally, the current constitutional architecture was designed after the end of fascism and WWII to thwart any authoritarian tendencies. From this point of view, it is very difficult to draw parallels to Brexit and Donald Trump’s election.